Looking for Farmhouse White Pin Tuck in Queen or King Sizes? Make a statement with your college bedding with our truly beautiful Farmhouse White Pin Tuck Twin XL Comforter! This stunning college comforter features a pretty off-white color that has the slightest hint of gray that will easily match up your extra long Twin bed with the rest of your dorm room decor. This off white dorm comforter also features an elegant pin tuck pattern that will add extra beauty to your decorative Twin XL bedding. The gorgeous look that this pin Twin extra long comforter and matching standard college pillow sham set will add to your dorm bedding will positively impact the rest of your dorm decor. Both the college comforter and matching dorm pillow shams are machine washable, so you can keep displaying the stylish look of this one of a kind Twin XL comforter. While it is easy to see how great this off-white dorm comforter with pin tuck details will look in your dorm room, it might be harder to imagine the comfort until you touch it. Fortunately, this incredible pin tuck college comforter is made with the most comfortable materials to give you soft Twin XL bedding. A thicker than average inner fill is covered with a super soft microfiber exterior, which will make your college bedding feel amazingly comfortable. 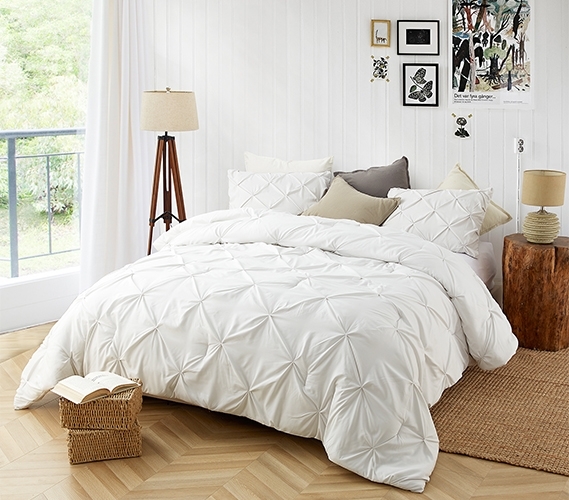 A stunning look and cozy comfort make this one of a kind off-white Twin extra long comforter a dorm bedding essential!